Mace® Pepper Gel LARGE MODEL is a (Patent Pending) formulation of pepper spray which is suspended in Gel instead of a liquid stream. 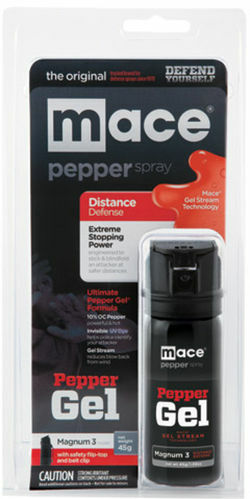 MACE PEPPER GEL is a (Patent Pending) formulation of pepper spray which is suspended in Gel instead of a liquid stream. Effective Range:18 feet, Flip-top safety cap to prevent accidental spraying.